A red, green and blue image of NGC 1275, which was created by combining the data using Hubble's three Advanced Camera for Survey filters. The three images were processed with the method of Lupton et al (2004) to preserve the colour of objects avoiding saturation. The detail in the ilaments was enhanced by using the unsharp mask filter in the GNU Image Manipulation Tool. 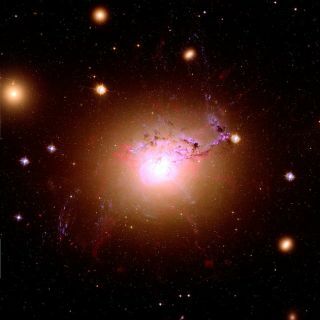 Scientists have discovered the forces that bind together a strangenetwork of 100-million-year-old, rope-like gas filaments that extend from anenormous elliptical galaxy. The filaments presented a puzzle because they should normallycollapse under the pressure of the hotter surrounding gas. New images from the Hubble SpaceTelescope showed individual gas threads bundled together within thefilaments, which allowed researchers to estimate the magnetic fields necessaryto hold everything together. "When you see a piece of rope from a distance it looks solid,but when you look closely there's a lot of threads," said Andrew Fabian,an astrophysicist at the University of Cambridge, U.K., who led the studydetailed in this week's issue of the journal Nature. "It's not an astounding surprise, but the thing we can do iscalculate the magnitude of the magnetic field from the size of thefilaments," Fabian told SPACE.com. "Everything checksout." The filaments may represent the most visible effect of thegalaxy's central black hole on its gaseous surroundings. The black hole's high-energyjets have heated up the gas to about 70 million degrees Fahrenheit (40million Kelvin), which in turn produces glowing bubbles that float outward fromthe galaxy center. The bubbles pull colder gas outward behind them in the form of thetrailing filaments. Some filaments extend in radial lines outward from thegalaxy center, while others appear as horseshoe shapes. Cold gas within the filaments could normally begin to condense andstartforming stars, but the filaments' magnetic fields push against thegravitational pressure and prevent star-birth. Fabian and his study coauthors from the U.K. and United States seeNGC 1275 as just the closest example of many objects that could have filamentstructures. "It's known that many distant, massive galaxies aresurrounded by nebulae of gas which must be filamentary or clumpy," Fabiannoted. "We think similar filaments are there in those distantobjects."